After my last blog entry about Solaris 11 Automated Install without a network boot I was thinking that we have all the building blocks to do a true standaone install of Solaris 11 without any network connection at all. 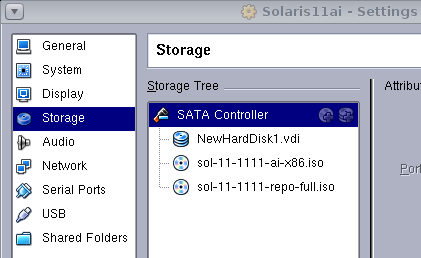 Oracle gives us the iso's for "Oracle Solaris 11 11/11 Automated Installer" and the full "Oracle Solaris 11 11/11 Repository Image" from the Solaris download page, so why do we need a network! The problem is that the repository is 7GB so testing it is a little difficult and trying to put the above two ISO's onto one 8GB USB is even harder. At this stage I have been unable to put the 7GB repository ISO onto a USB stick. Also, unable to combine the 2 ISO into 1 ISO which works (I end up with repository errors on install)! But, in theory it will work and to demonstrate the idea I will use VirtualBox and a network for the manifest file (ONLY for manifest file!). You can use my previous blog to replace the AI boot image with a modified one. At this point it should go off and install the software. The perfect solution which I am happy for someone to try is to place the both AI boot and repository onto one ISO and then use no network, but I have failed so far! What was the process you used to try to combine the repo onto the stick with the boot image? I would expect that to be possible, though I haven't done it. Happy to help work it out, though. I got it working in the end. I am not sure what has changed, but I have managed to create an ISO and boot off it via VirtualBox. I will try USB stick next.